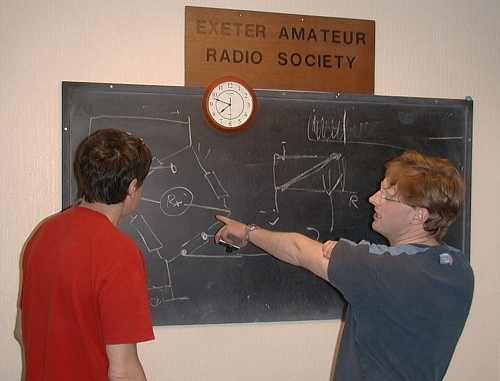 Exeter amateur radio club (EARS) is fully accredited to offer training and assistance to all prospective radio amateurs wishing to gain UK licenses. Foundation; includes practical elements and a 26 question multiple choice exam paper (pass mark 19). Intermediate: includes practical elements and a 46 question multiple choice exam paper (pass mark 35). Full: A single theoretical knowledge based exam - no practical assessment - 67 questions (pass mark 47). Each license must be gained in order of progression, the first two levels have practical elements, which are assessed on site by the training team. The 'Full' license is based on a candidate's theoretical knowledge of the relevant subject matter. EARS meets every other Wednesday at the ‘America’s Hall’ De La Rue Way, Pinhoe, Exeter from 18:00 hrs to 2100 hrs (ish) . Members also meet socially on a Tuesday morning at 'Bills Cafe' just off Gandy Street in the precinct of Exeter shopping centre. As club rules stand at the moment, training is only offered to those who are EARS members - membership for adults is currently £30 a year, under 18's £10* (EARS is affiliated to the Radio Society of Great Britain (RSGB)). As the club training team develops the delivery of the training packages further nominal charges may well be levied for training materials, consumables etc. You would also be liable to pay for the exam (ALL members of the EARS Training Team are volunteers, taking no payment for their activities with the Training Team). Check when the next training cycle starts, select the relevant course and date. Log onto www.RSGB.org, got to the 'shop' page and purchase the 'Foundation Now' course handbook. It would also be beneficial to join the RSGB, those under 18 get free membership - ring them on +44 (0)1234 832 700 - avoid using the website, it has a glitch that requires a callsign to make a application to join over the internet. It would also be beneficial to log into and join (for free) the website called 'Ham Tests UK' - this site will greatly assist when doing practice exams. Acquire the course hand book 'Intermediate License' from the RSGB Shop. Log into and join the website 'Ham Tests UK'. Overseas Visitors - Non UK License Holders. Please check with your licensing issuing authority AND the Radio Society of Great Britain to ensure that you are licensed to operate while you are here in the UK. As a general rule of thumb, unless you hold the equivalent of the UK FULL license the it is doubtful that you will be allowed to operate, again it is best if you double check it might be that the UK operates a reciprocal licensing agreement with your country or that you are covered by the CEPT agreement. Exeter Amateur Radio club welcomes requests for assistance from overseas visitors, but at this time we are not able to deliver distance learning packages. If you have any further queries or questions about license training etc. then please do not hesitate to contact on the above email address, we will be very pleased to hear from you. In line with the RSGB & OfCom, EARS operates a policy of inclusion regardless of status. There is wheelchair access to our meeting room from the America Hall car park. If you require assistance please notify us well in advance. Alan G4TKV and Matt M0SBI going over the finer points of voltage bridges.